In the wake of the election of Donald Trump, it’s been difficult not to view any work of art through that particular extra-textual lens—perhaps lending certain films a resonance they might not have had before “Trump’s America” became a reality. Denis Villeneuve’s Arrival is a fine sci-fi picture in its own right, but its implicit endorsement of understanding a language, and by extension a culture, foreign to our own couldn’t help but seem so much more timely after a political campaign like Trump’s that thrived on rhetoric of xenophobia and isolationism. The upcoming Miss Sloane—a thriller about a powerful lobbyist with an apparently limited moral compass—may have seemed like a preaching-to-the-liberal-choir variation on Michael Clayton before November 9th. Now its cynicism feels almost cathartic. In this topical light, it’s possible I may be overvaluing new documentary Disturbing the Peace. Stephen Apkon and Andrew Young’s film fits the activist-documentary mode to a T: talking heads galore (given a slightly novel twist by the filmmakers’ adoption of Errol Morris’s direct-to-the-camera Interrotron style); somewhat cheesy reenactments; a second half that teeters on the edge of self-congratulation; an ending that tries to leave us all inspired by the possibility of change. As filmmaking, there’s nothing especially inventive going on here. And yet, especially in this current divisive political climate, it’s churlish to dismiss a film like this—one that is all about unity, empathy and bridging cultural divides—simply on the basis of such relatively negligible aesthetics. 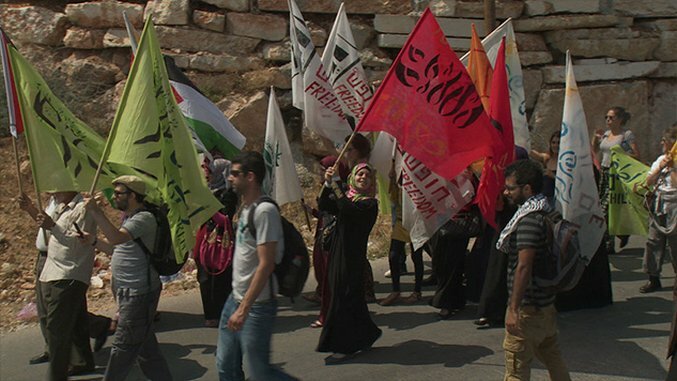 Disturbing the Peace revolves around a group called Combatants for Peace, a Middle East-based organization comprised of both Israelis and Palestinians working together and using nonviolent methods of protest to try to bring an end to the Israeli-Palestinian conflict. You’ve probably never heard of them, of course, because news outlets—especially American ones—tend to focus only on the bloodshed in the region. With so much violence between both groups, and with so many widely publicized efforts at diplomacy collapsing, it’s no wonder many people on the outside looking in feel despair about a peaceful solution ever arising. Combatants for Peace, however, denies vehemently such hopelessness. Such optimism, however, has hardly come automatically for the group’s members, many of them former soldiers and fighters on both sides. In the first half of Disturbing the Peace, many of the individual members tell their stories, and some of them are indeed heartbreaking. Israeli Maia Hascal witnessed many of her colleagues killed while she served as part of the nation’s Defense Forces. Palestinian Jamel Qassas watched his brother get murdered by Israeli soldiers during the First Intifada. Palestinian Shifa al-Qudsi decided to carry out her own suicide attack before she was caught and imprisoned for six years. All of these perspectives, though, are masterfully woven together by editor Ori Derdikman into a tapestry that suggests a miniature history of the Israeli-Palestinian conflict, one full of buried hatreds and resentments which have festered over many decades. All of the featured interview subjects eventually have a moment of revelation that leads them to transcend the blanket demonizing on both sides to tap into their capacity for empathy. For Palestinian Suliman al-Khatib, it’s a viewing of Steven Spielberg’s Schindler’s List while he was serving a 10-year prison term in Israel; for Qassas, it’s seeing his own mother crying over the deaths of Israeli children and sharing in the pain of Palestinian mothers. Perhaps Apkon and Young’s most brilliant strategy is to avoid any mention of Combatants for Peace until it is actually created midway through the film, allowing such moments of road-to-Damascus conversion to feel earned rather than preordained. The second half of Disturbing the Peace mostly chronicles the efforts of the group to make their mark on the fraught political landscape through public protests and private dialogues. As briefly suggested earlier, this is arguably the less immediately compelling half, at times coming off as little more than a glorified advertisement for the cause, however noble, but there are occasional disturbances in its general wave of affirmation. Most notable is a domestic scene with Qassas and his family, as he and his wife get into a heated argument over whether he should bring his daughters to a Combatants for Peace protest. Though the filmmakers clearly align with the magnanimous long-range vision Qassas expresses, his wife’s arguments—articulating the resentment at the heart of Palestinians’ view of Israelis—offer a sobering reminder of just how steep this group’s climb is in essentially convincing a whole generation of people to put aside decades-long biases and embrace compassion. This is only further emphasized when the latest attempts at peace talks between Israel Prime Minister Benjamin Netanyahu and Palestine President Mahmoud Abbas break down, leading to a new cycle of violence and a sense of discouragement among Combatants members. And yet, the group soldiers on nevertheless, staging a mass rally in a public square in Israel even as some Israelis call them traitors and openly wish for their deaths. No doubt U.S. viewers will see a scene like this and immediately think of the many appalling news stories of emboldened racism and sexism in the wake of Donald Trump’s election—but it’s not like the other side is completely exempt from blame, with many Democrats now forced to look inward and assess whether they did enough to address the underlying working-class resentments that are now flaring into the open. Maybe, in chronicling the exploits of a band of Israelis and Palestinians making a very public effort to reach across the aisle and suggest a peaceful way forward for the two nations, Disturbing the Peace is the kind of movie we need at this moment, aesthetic concerns be damned. Kenji Fujishima is a freelance film critic, contributing to Slant Magazine, Brooklyn Magazine, The Playlist and the Village Voice. He is also Deputy Editor of Movie Mezzanine. When he’s not watching movies or writing and editing film criticism, he’s trying to absorb as much music, art and literature as possible. He has not infrequently been called a “culture vulture” for that reason.